There is no info for this specific disc but it can be assumed the mix is the same as the original single (which featured the full drum beat ending). 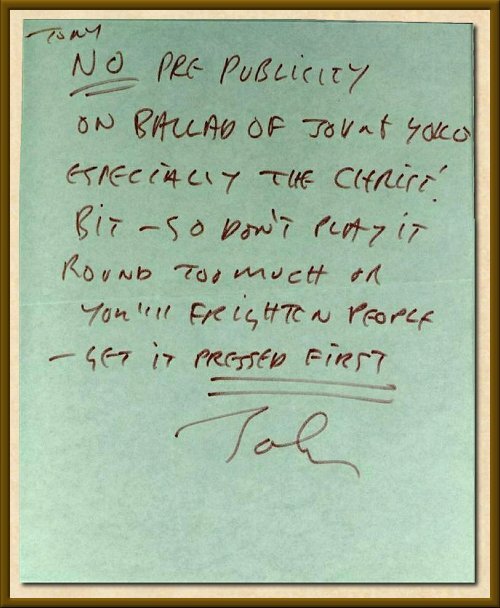 A Note Written By John Lennon To Tony Bramwell Regarding The Release of The Ballad of John and Yoko. This item was recently auctioned. I no longer have the specific info. NEAR MINT AND ULTRA RARE ! ABSOLUTELY ONE OF THE RAREST TEST PRESSINGS TO EVER FIND IS AN ORIGINAL GROUP TITLE ISSUED WHILE THE BAND WAS STILL TOGETHER! 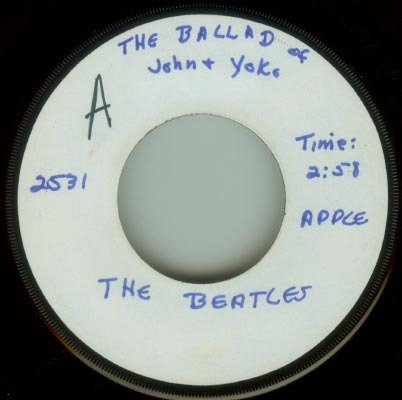 THEY DIDN'T MAKE TEST PRESSINGS FOR EVERY BEATLES SONG, SO THE ONES THAT DO EXIST ARE INCREDIBLY RARE! 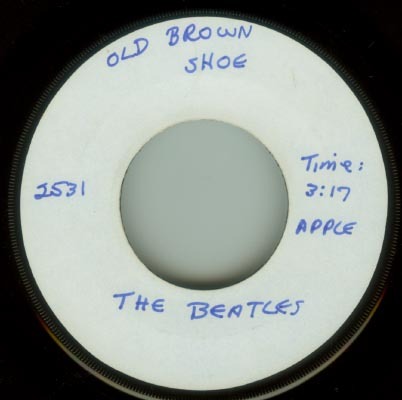 THIS ONE IS THE ORIGINAL WHITE LABEL TEST PRESSING FOR THEIR CLASSIC "BALLAD OF JOHN AND YOKO/Old Brown Shoe" 45 (Apple 2531). THIS ONE WAS PRESSEDN IN 1969. YOU WON'T GET A CHANCE TO OFTEN TO GRAB ONE OF THESE SO HERE'S YOUR CHANCE TO GET A BONAFIDE ORIGINAL ISSUE! 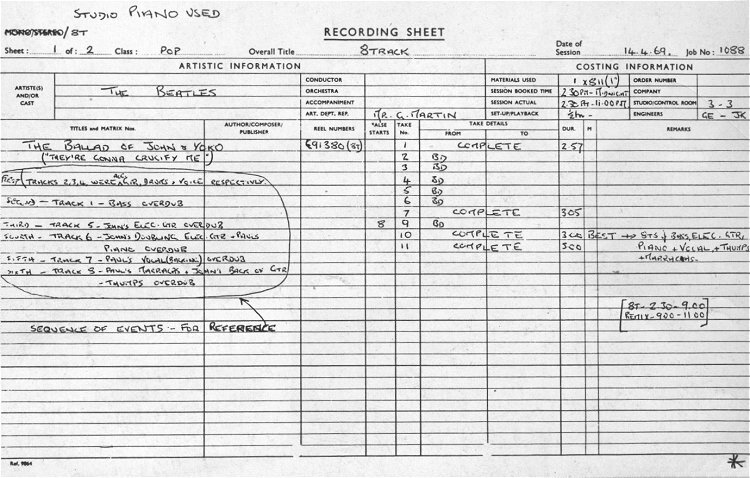 ALL WHITE LABELS WITH THE TITLES HAND WRITTEN IN IS THE STANDARD PROCEDURE FOR TP RECORDS OF THE TIME. VINYL IS NEAR MINT! LABELS ARE NEAR MINT TOO WITH THE APPROPRIATE INFO. WRITTEN IN! 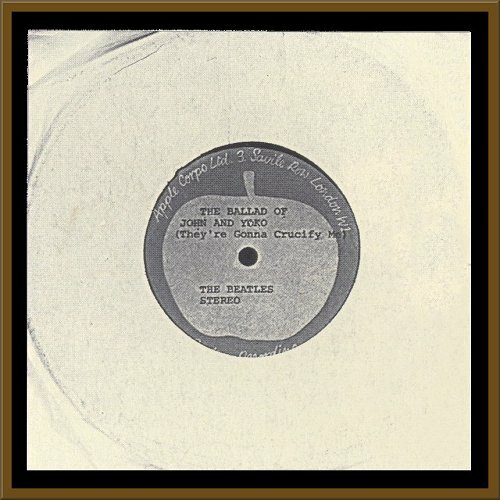 IF YOU'RE INTO THE REALLY RARE BEATLES RECORDS, OR IF YOU JUST WOULD LIKE ONE EXAMPLE OF AN ORIGINAL BEATLES TEST PRESSING 45, HERE'S A GREAT OPPORTUNITY! SIMPLY STUNNING! CHECK OUT THE PICTURES!